Poet Lesléa Newman, author of the lesbian children’s book Heather Has Two Mommies, arrived in Laramie,Wyoming in the fall of 1998, just five days after 21-year-old gay man Matthew Shepard was discovered in the wild, tied to a fence, crying, beaten and dying. She was scheduled to give the keynote address at the University of Wyoming’s Gay Awareness Week, an event Matthew had planned on attending. Homophobia and gay bashing, of which Matthew was the ultimate victim and martyr, was her topic and the recent hate crime, reported locally, nationally and internationally, only made her presence and her speech that much more poignant. 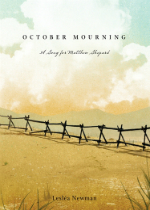 14 years later, Newman is releasing October Mourning: A Song for Matthew Shepard, a novel in verse featuring over sixty poems describing the Matthew Shepard experience. The poet explores the tragic event from several points of view, including the fence Matthew was tied to, a doe who kept vigil by the dying youth and the trial personnel involved in prosecuting the two young men who beat Matthew to death. The poems in Newman’s October Mourning build over the course of the verse novel, creatively bringing sundry elements of the event into anthropomorphic light, the tragedy of Mr. Shepard’s death slowly growing until the reader is left with a profound sense of loss, perhaps even tears. It is a tribute and memorial to a gay martyr whose legacy in death is a permanently increased awareness in Wyoming, The West, America and the world about the heinous nature and evil of hate crime. 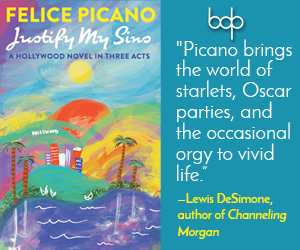 One drawback to the work is its naive quality; the slightly adolescent tone of the verse often doesn’t match the overwhelming tragic quality of the event itself. For a more emotionally realized examination of the event, make sure to read a copy of Judy Shepard’s (Matthew’s mother and a gay rights activist) memorial tome. 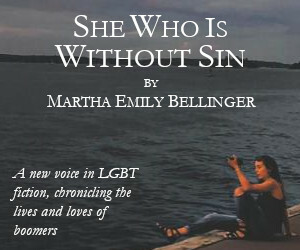 That said, the gay world has not been the same in the fourteen years since Matthew Shepard’s death and the gay community will surely appreciate October Mourning: A Song for Matthew Shepard, a new work and educational experience for a young 21st century readership that was too young to remember his death at the end of the 20th century.